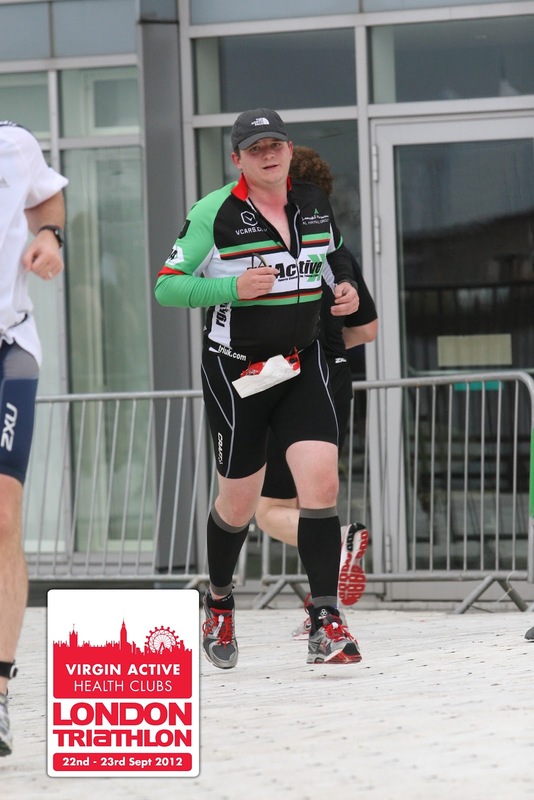 At the outset of this journey it was my aim to complete the London Triathlon. Well this week was race week and I just want to know where the time went? 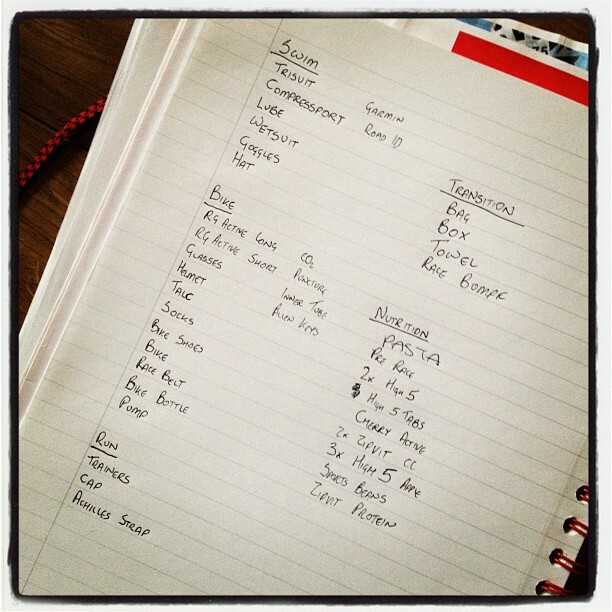 My preparation during the week for the event did not go very well. I went for a run on Tuesday night but felt like I had a really tight calf so I cut short my run as I didn't want to injure myself. 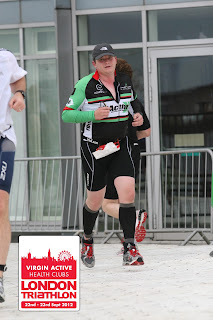 I didn't go swimming on Wednesday either as my trisuit burn from last Thursday still wasn't better and I did not want to aggrevate my neck before the event on Sunday. But enough of the claptrap. The real reason you're here is to read about the main event, the big one, the goal for this year and the reason I started this quest. The Saturday was spent spending a small fortune at the London Triathlon Expo. I got up and shaved my legs so that I could get some Kinesiology Tape applied to my various injuries in advance of the Triathlon on Sunday. 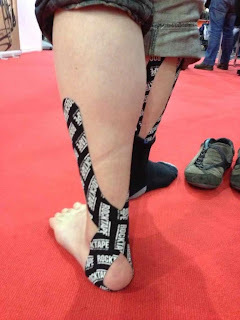 The Osteopath supplied by Rocktape did a superb job taping me up and up until I jumped in the water on Sunday my tape stayed in place but more on that in a minute. I wish I had used the H2O version so it stayed in place in the water. 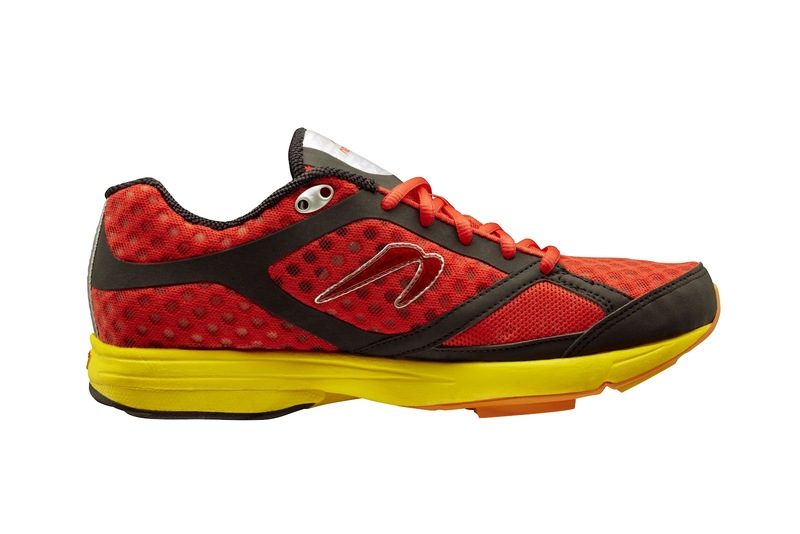 I am also now the owner of some Newton Gravity trainers and I can't wait to try these out when I recover from my niggles and the exertions of yesterday. I also found a wonderful invention and purchased these as well. A headphone which doesn't go in your ear but still allows you to listen to music by conductive bone technology. I'll be able to wear these on my bike and still hear the traffic. Amazing. See I told you I spent a fortune. 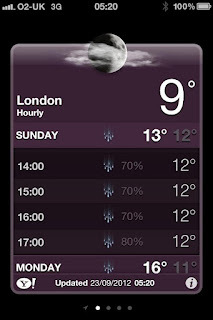 On Sunday I woke up and the rain that was forecast didn't appear to have materialised. I woke up at 05:22 which had the race times been normal would not have been a problem but given my start wasn't until 14:05, this left me with some time to spare. 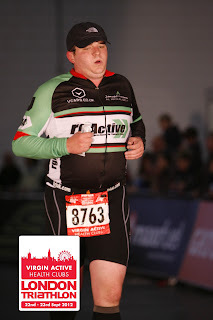 I think my pre race nerves were very prevalent as I had two triathlon related nightmares on Saturday night. I won't bore you with randomness of my psyche but one involved me being late and running over some watermelons in my car in my haste to get from London to Nottingham as the race had been moved at the last minute. At a more reasonable hour I went for breakfast before repacking all my triathlon gear for the event. 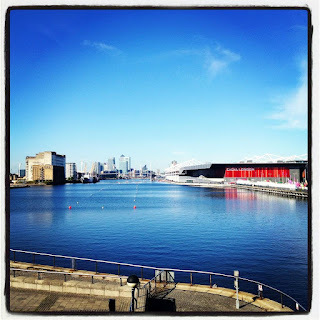 After everything had been packed and I had changed into my trisuit, me and my family walked over to the Excel. Needless to say it had now started to rain much to my dismay. I arrived at about half eleven. Plenty of time before the start. I racked my bike at 12:40 after I had had some pasta as a pre race meal. Preparing my transition area took a lot less time than it did at Hatfield. 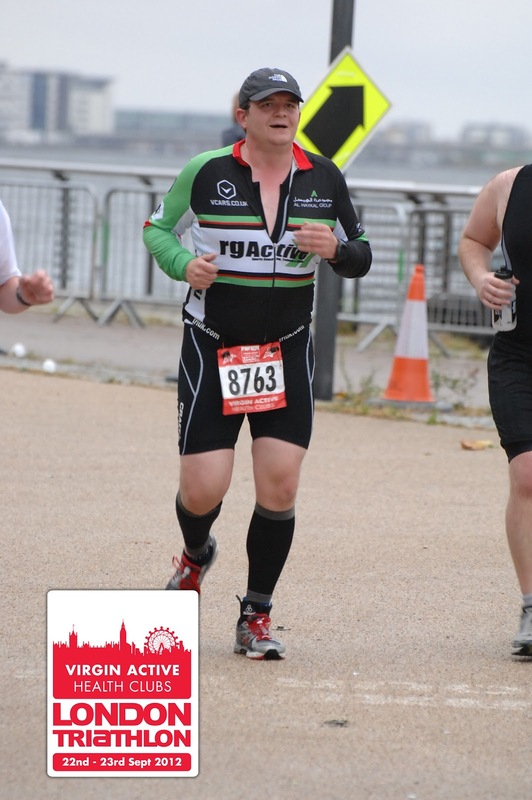 Guess I must be getting used to this triathlon lark. 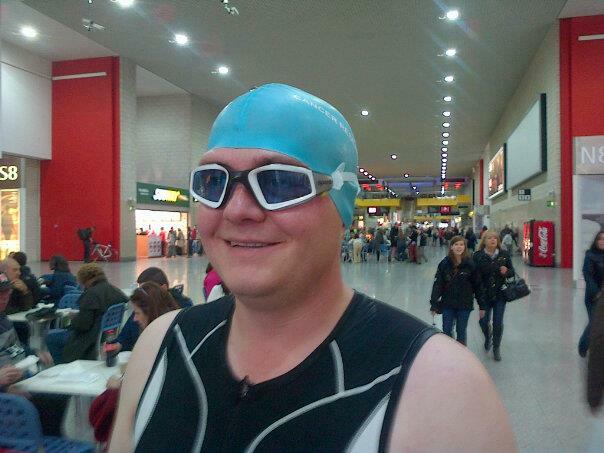 I even had time to pop back and see my family and friends before the swim brief and my Dad took the chance to take the obligatory embarrassing photo. The pre swim brief took place at 13:50 and it was quite informative although I sense it was aimed at people who hadn't done any open water swimming beforehand as though swimming in a wetsuit is easy! There was someone stood next to me at the swim briefing who was wearing a windsurfing type wetsuit rather than a swimming wetsuit, I have no idea if he even managed to finish the swim. I also saw some people over the course of the weekend with wetsuits on back to front. I was a bit overwhelmed at the amount of people who were in my wave. There were over 350 so it was split in two and unfortunately I was in the first half which was actually over half. Cue walking outside into torrential rain. Oh great I'd forgotten about that. We jumped into the water which was probably the coldest I have swum in since I started this journey. We then had to wait for about 5 minutes before we set off. This was good as it allowed my extremities time to get used to the temperature. I tried to manoeuvre my way to the frontish of the swim pack as it is the discipline which I am best at. The trouble was I didn't get close enough to the front and as soon as the klaxon went off I was caught in a flurry of thrashing arms and legs. To describe it as a washing machine is an understatement, there is nothing that compares to it. The rain hammering down on your head and arms and legs violently moving within inches of your head. To be fair it was a touch scary. I could not find a way through the people in front of me who held me up. I finally managed to overtake some people after about 400m. I really am too polite for competitive swimming and stopped if I hit anyone. I need to get over this for next year. Down the starting straight I managed to settle into my rhythm and was feeling really good (after the overtaking) until I reached the first turn point where the usual congestion occured. On the back straight, all was going well and I appeared to be on my own for about half the length until someone overtook me and then proceeded to slow down in my path. I think they were struggling. I couldn't overtake them immediately as I was starting to tire so I conserved some energy until I felt I had enough in the tank to overtake the person. I did this before the final turn. 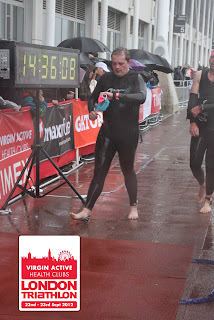 I am sure the weather took a turn for the worse when we were in the water as the final 200m was horrific. The waves had got worse which means the wind must have picked up (oh wonderful the bike ride was going to be fun). I am so glad I breath to my left as luckily the waves hit me in the back of the head with each breath whereas some people who breath to the right would have got a faceful of water with every breath. I exited the water a little unsteadily in a time of 00:32:31. I seriously think this could have been under 30 minutes without the holdups I suffered and with better weather. Exiting the water. God it was cold on the feet. 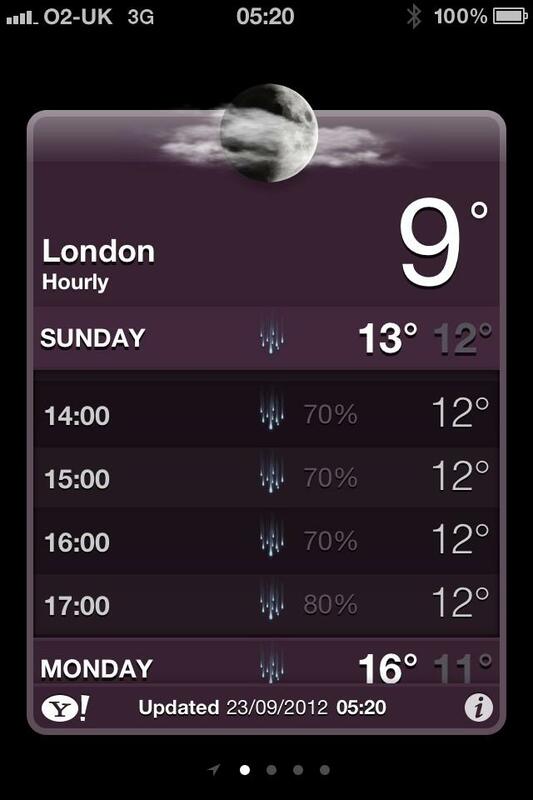 London is very well organised as they have people with bags for you to put your wetsuit in. 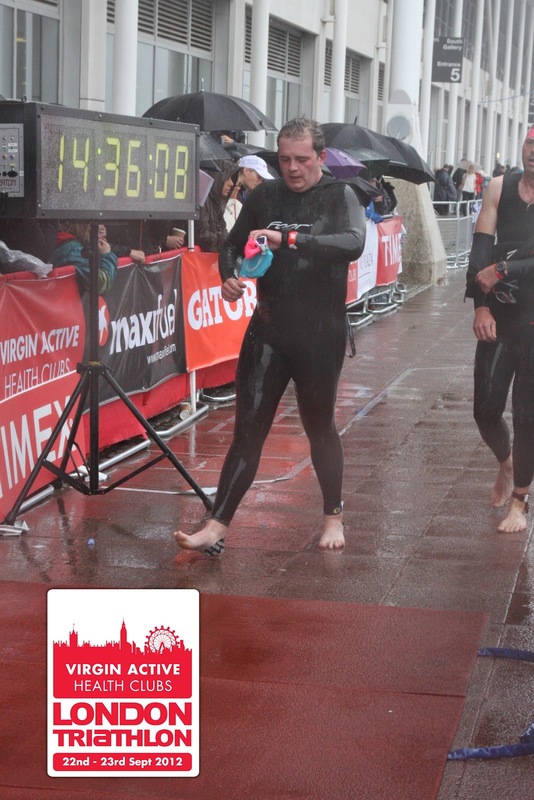 You enter T1 as soon as you exit the water and then run along some matting taking your wetsuit off. 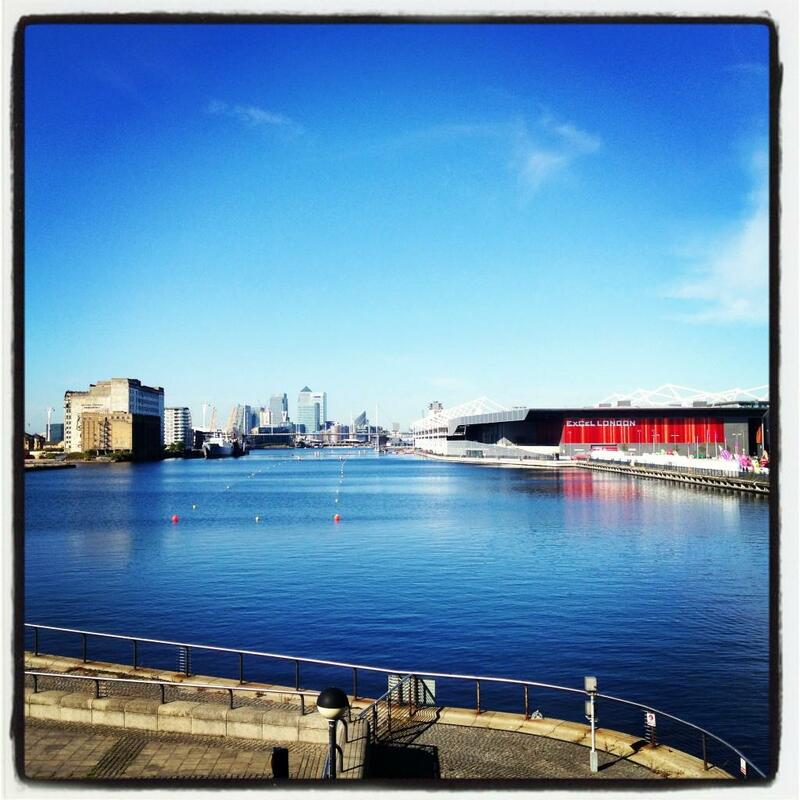 Then you climb some stairs into Excel before running round the transition area to enter you bike lane. My feet felt like blocks of ice and the matting felt like needles underfoot. While I was walking on the matting as my feet weren't functioning enough to jog, a cyclist coming in told me how cold it was outside. I finally got to my bike and had to make a snap decision. I hadn't left my long sleeved cycling top out but given the advice I had just received decided to retrieve it from my transition bag. I then struggled with getting my top and socks on. After putting my bike shoes on I made my way to transition exit. The floor underfoot was very slippery which when combined with road shoes and cleats created a tricky 100m. I even skated along some of the way as I got bored of taking baby steps. 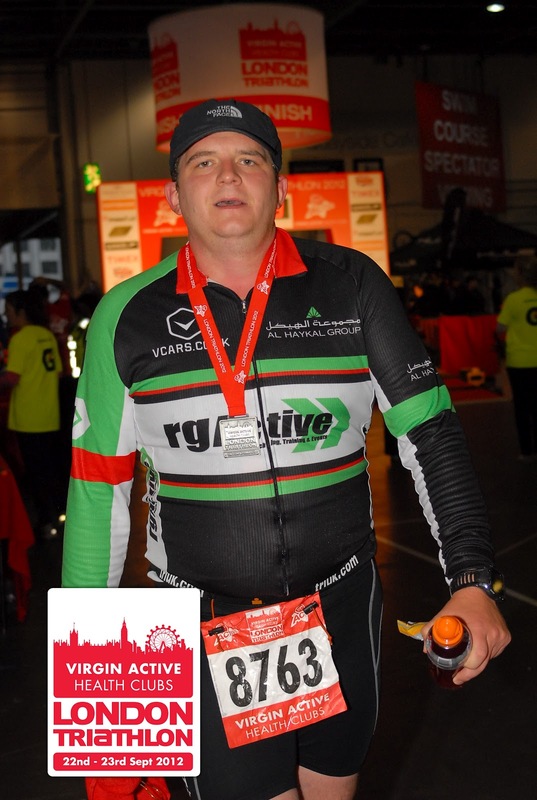 Anway I finally got on my bike and transition took a staggering 00:10:24. The bike ride was a little on the bizarre front when combined with the rain of biblical proportions. Thank you to the random cyclist for the advice on the top. I'm sure this was a race saver. The course was a lot hillier than I envisaged as it took in the Limehouse Link Tunnel. The wind was horrific and the driving rain was soul destroying. I managed to overtake some people but equally got overtaken. My first lap seemed a lot quicker than my second. 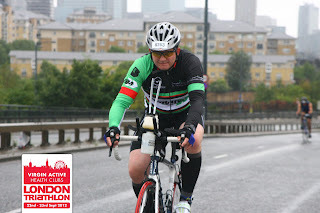 At one point after exiting the Limehouse Link Tunnel (on the first lap) I nearly got blown off my bike as there was a horrendous crosswind. The driving rain meant that I was drenched throughout the entirety of my bike ride. And I mean drenched, I am sure every ounce of spare space in my shoes was filled with water. I am so glad I decided on the top and the glasses as my vision was unaffected. The course was littered with biking detritus from the normal (gel wrappers) to the weird (a pedal clip) as well as several bike bottle and pumps. I was so glad of the glasses as you had to concentrate all the time. I passed lots of people who had suffered punctures and felt so bad for them but so relieved that it wasn't me. 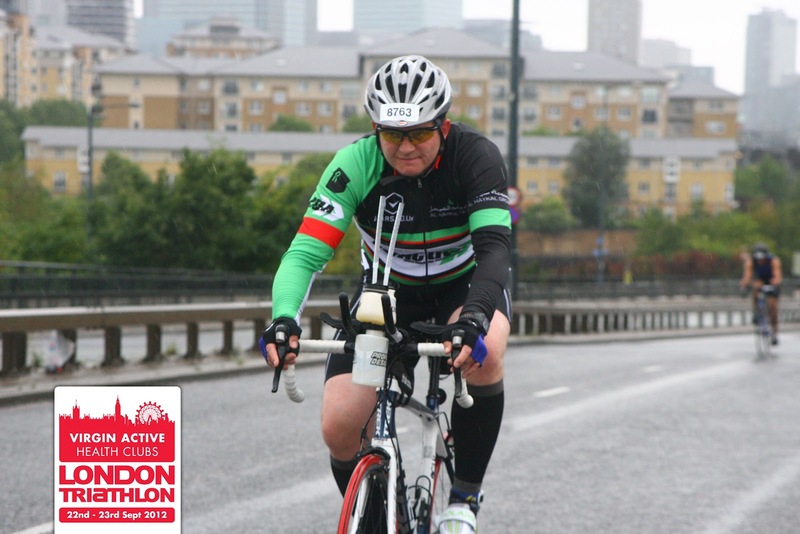 The headwind at times was mental I felt like I was going backwards but I kept on pedalling. During the ride I managed to set a new PB for highest and lowest speeds when on the road. 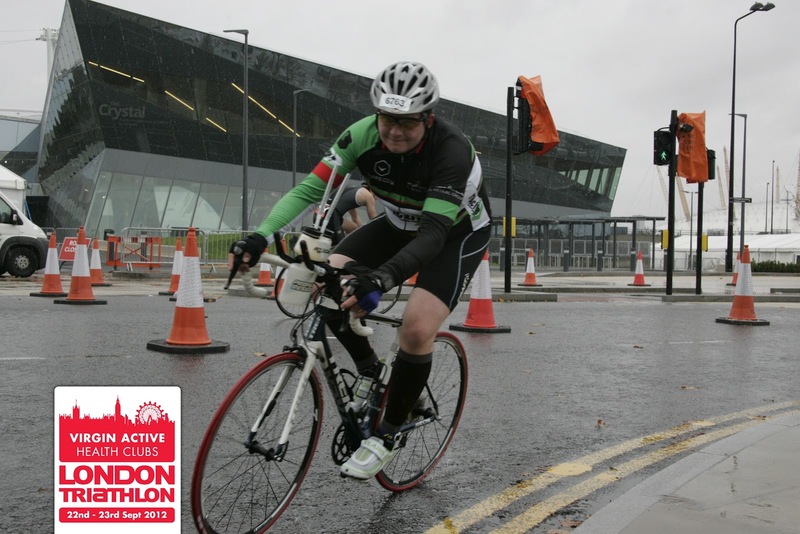 Due to the weather you had to dismount on entering transition to negotiate a chicane but then you were allowed to remount your bike to complete the final climb. All a little bizzare but safety comes first. And I was glad to get back on my bike as it was preferable to running on a tarmac road in wet cold socks. My time for the 35ish km bike ride was 01:25:02, I can live with that given the horrific conditions. Having learnt from my epoxy flooring skating bike exit. I ensured my shoes were off when I got off the bike so I had some purchase on the flooring. Transition was a disaster zone, what with my stuff strewn everywhere after searching for my top and other peoples disregard for your space. After clearing some space for my bike I proceeded to apply my achilles strap. I had hoped to not need this but as my Rocktape came off at the start of the swim, I decided not to chance it. My Greeper Laces were once again immense and I had my shoes tied in seconds. And I mean securely tied not like you get with elastic lock laces. After putting my trainers and cap on I set off at a gentle jog. And I mean a gentle jog as my legs didn't feel like mine. Anyway the reason I cut my run short earlier in the week, according to the osteopath who fitted my kinesiology tape was that I have shin splints in my right leg. 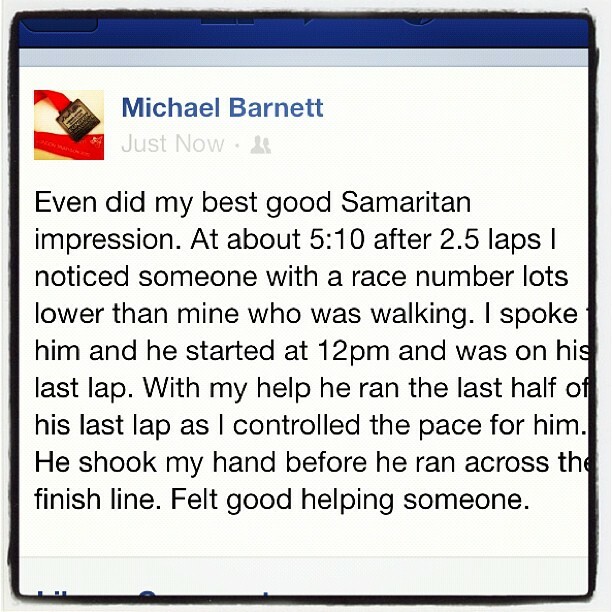 Seeing my swim coach at the end of lap one spurred me on. 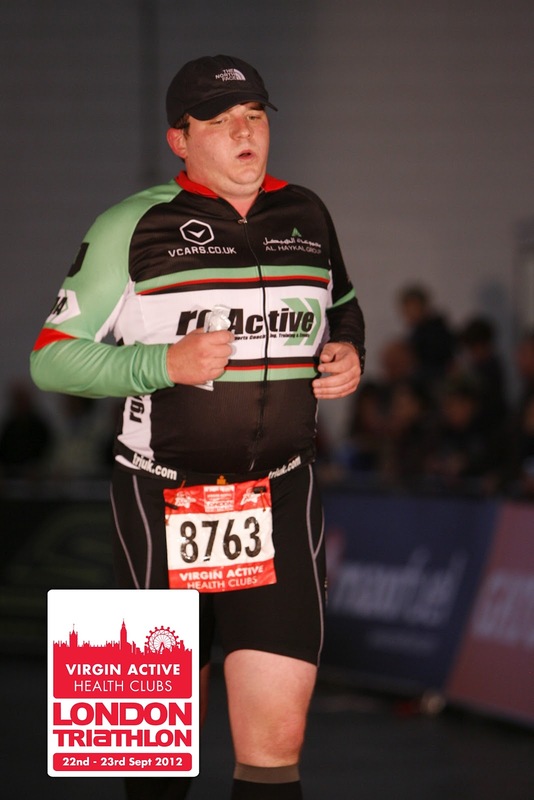 Seeing my family and friends at the end of lap two gave me a kick up the arse. Due to the weather the course had the added complication of a 6 inch deep puddle across the course which meant I (and everyone else) had to traverse this 10 foot wide puddle 8 times. Some people minced their way through it on tip toes as if there feet wouldn't get wet but I thought balls to it and steamed through it and learnt that getting my feet drenched twice a lap was quite refreshing. At about 2.5 laps I noticed someone walking, I decided I would try and help him get moving again as he looked to be struggling. I noticed his race number was a lot lower than mine and using my incredible powers of deduction worked out he had been going a lot longer than me. It transpired he started at 12:00, a full 125 minutes before me. His name was Dean and he was on his last lap. With a bit of coaxing and encouragement I managed to get Dean running again. 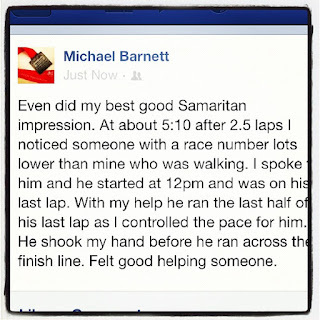 I controlled the pace for him and he didn't stop running once in that last half a lap. Before the finishing straight he stopped to shake my hand and thank me. Do you know something it is amazing being nice sometimes as you get thanked. But do you know something I have to thank Dean as much as he thanked me as controlling the pace for him made that half a lap fly by. It also meant that my pace was very consistent unlike the rest of my race where I couldn't find my rhythm. 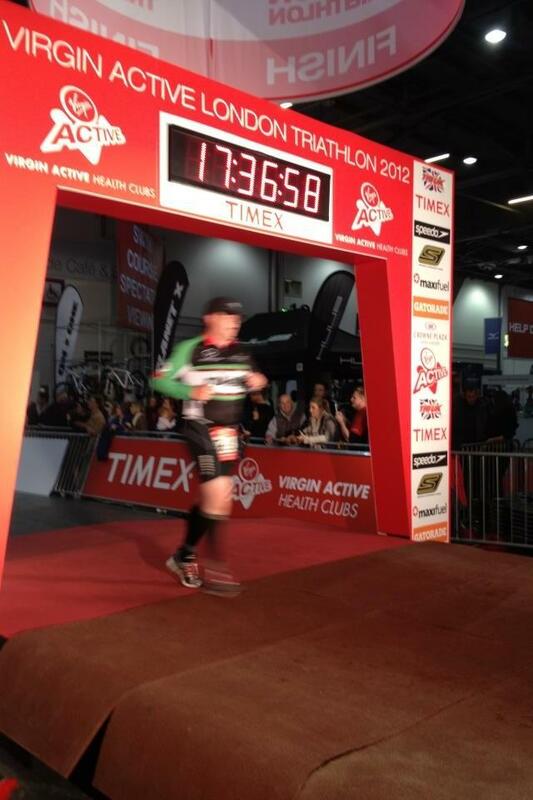 On seeing my family at the end of this lap, (I very nearly started crying). 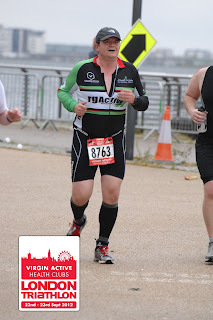 So this was it me against 2.5km in my quest to complete the London Triathlon. How far had I come on this journey from a smoker. I was 1.5 miles away from my goal. And this pride and the support and cheers of my family and friends (as well as the CRUK and other support crews who braved the elements) kept me going. The rain teemed down on me for the first half of my last lap. My first two foot off the floor photo. This was endurance at its most raw. Me against me and only I could fail, I knew I wouldn't when I had come this far. I trudged through the last 2.5km at some points singing "Singing in the Rain" (well it seemed fitting) and with each passing step I knew I was a step closer to my goal. A goal which at the start of this quest seemed like a pipe dream. A goal which I have sweated for, injured myself even bled for. I mounted that ramp into the Excel for the final time and promised myself I would not walk again until I had crossed that bloody finish line. I crossed the line with a final cheer of support from my family and felt such an overwhelming sense of satisfaction that I had completed my quest. My run time was 01:20:16 and my friends were amazed at how consistent my lap times were. 20 minutes per lap almost to the second. My total time for the triathlon was 03:32:57. I missed my target time by 2 minutes and 57 seconds but given the torrential rain I think I did very well. On the finishing ramp. Looking a bit tired. My wife came to greet me and her hugging me was like a pneumatic drill cracking a dam. The floodgates opened and I started to sob, I left everything I had out on that 47 (ish) km and my unintelligible sobs were proof of that. Fast forward three minutes and I could reflect on what I have achieved. I gave up smoking and set myself a goal which I knew would be a huge challenge given I had done no formative exercise since 2007. 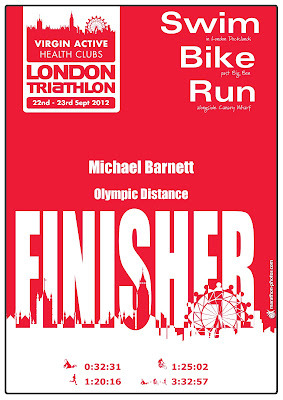 The goal was to complete an Olympic distance triathlon. The only person I was competing against was me. And do you know something I bloody smashed it. I beat my goal, I was my personal best. 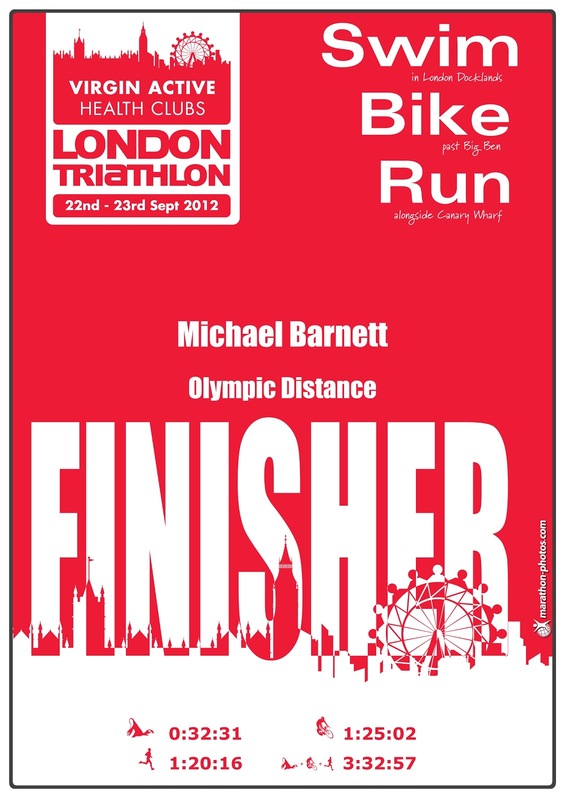 I set a new PB for an Olympic distance triathlon and I can't wait to do it again. I have unfinished business with this course due to the horrific monsoon like weather conditions and I'll be back. On Saturday the Virgin Active team ran a competition on Facebook to win a hoodie. It was a caption competition about a photo. I entered and won and should have a new hoodie from the event winging its way to me. The only problem is I had already purchased one. So I chose a different colour. I wouldn't change any element of the last 9 or so months. I am now a non smoker and a triathlete and I know I have surprised my friends and family. 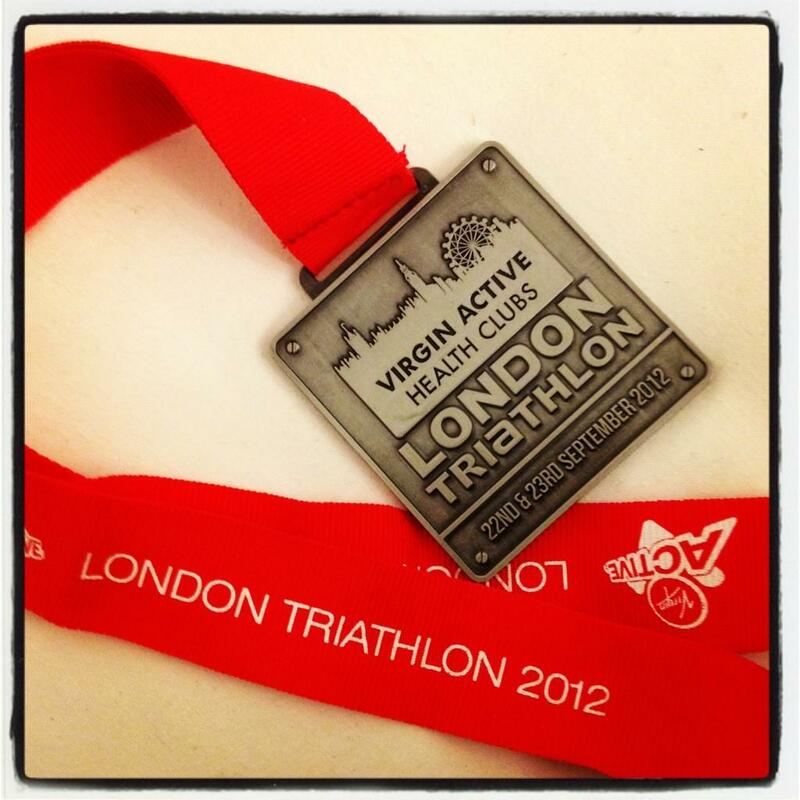 My Sister and Dad are proud of me and I have raised some much needed money for charity. I am my wifes hero. I can't ask for anything else. I hope you have enjoyed reading my musings. This is not the end of my journey but I will be taking a couple of weeks off to relax before I start training for my journey towards Outlaw. If my blog has inspired you to give up smoking then please sponsor me the price of a packet of cigarettes. It's not as if you're going to miss the £8.00. If you have found my blog humorous, emotional, inspiring, enjoyable or are just a regular reader, please sponsor me. It's all for a good cause. Congratulations. I couldn't do the race as I had a virus, but admire any and everyone that did. The conditions were grim at best. You've had my girlfriend (who did the sprint on Saturday) in tears. Inspirational stuff.